Many of you are likely aware of the 1980 self-titled reunion LP that Atomic Rooster had put out when organist Vincent Crane and guitarist / vocalist John DuCann had decided to work together again after an eight year absence. ' 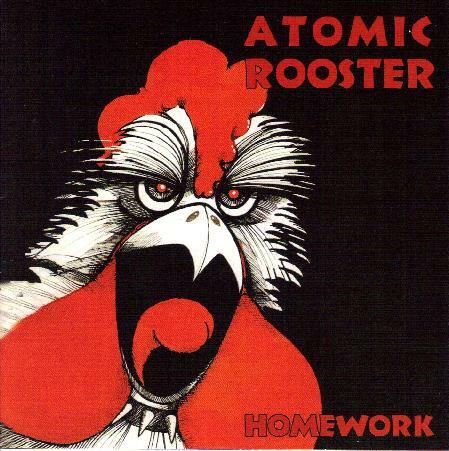 Homework' is the never released (until now) follow-up to that album that was regretfully shelved by the Polydor label. This 1981 piece of work had surpassed my expectations for sure. The first seventeen tracks are reportedly demos that John DuCann had spent nine months working on - playing all instruments and providing all the vocals. The next six cuts were previously released songs that have showed up on various Atomic Rooster compilations, featuring the classic Rooster line-up of DuCann - guitar & vocals, Vincent Crane - organ & piano and Paul Hammond - drums. Pretty much each and every one of these twenty-three songs were well written and clearly had strong arrangements intact. Tunes I dug the most were "Make Me Strong", "The Devil In Me", "Fool" (liked the great bluesy guitar work), "C.O.D. ", the wailing "Cut The Wire", the radical "City Boy" (with catchy riffs), the semi-corny "Leopard's Skin" and the disc's ballad (sort to speak) "Somebody's Looking After You?". Let's certainly not forget the extra ' bonus' cuts - that were the necessary tagged-on singles that were supposed to accompany this stellar heavy rock effort - the ripping "Rebel With A Cause" and the live versions of "Devil's Answer" and "Tomorrow Night" more than make this import title a true keeper. Store this one right next to your Rooster classics ' Death Walks Behind You', ' In Hearing Of Atomic Rooster ' and ' Live At The Marquee'. A must-have.